The ground floor is the big bar area with some seating as well. It took us a short while to figure out how to get to the restaurant part of The Cuban. We spotted a small elevator with a sign above it with an arrow pointing to the restaurant. The restaurant on the upper level had the music turned down a notch which was to our liking. We didn’t fancy having to have to raise our voices through our meal, especially seen as we would be chatting all evening. Even though we were half an hour early for our reservation, we were given a table straightaway. There were wicker chairs, wooden tables and wooden screens sectioned off some of the areas. The staff were really friendly and were attentive. Tapas was what we had in mind for this evening and the menu had a good range to choose from. The food at The Cuban seemed to have flavours from a few different countries. 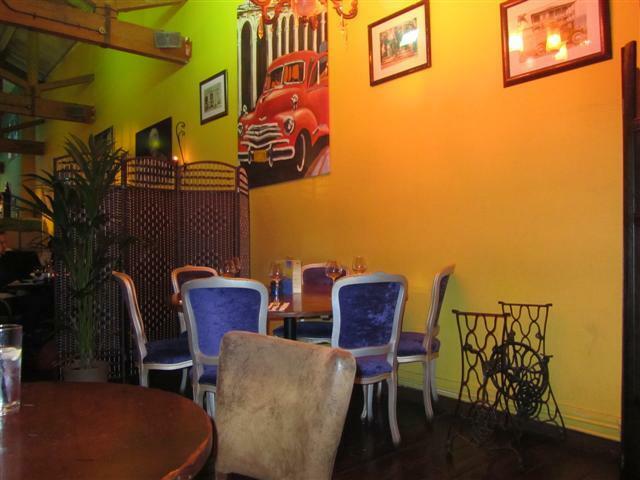 It was also a fusion of Cuban and Caribbean cuisine. 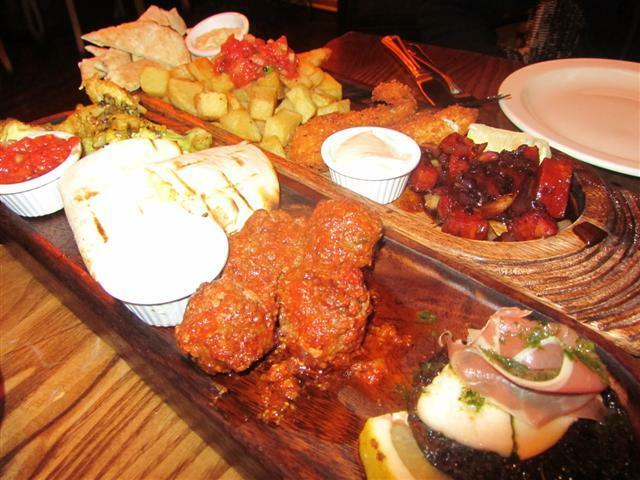 The tapas dishes were presented to us on two long wooden trays. This was quite different in comparison to the normal little clay dishes that I have had at other Tapas places. It was a good idea though to have these wooden platters, otherwise I think that we would have been struggling for space on our table. It was such a colourful selection of food and it all looked very tempting. Nothing disappointed us; it all tasted great and worked well with the additional dips. 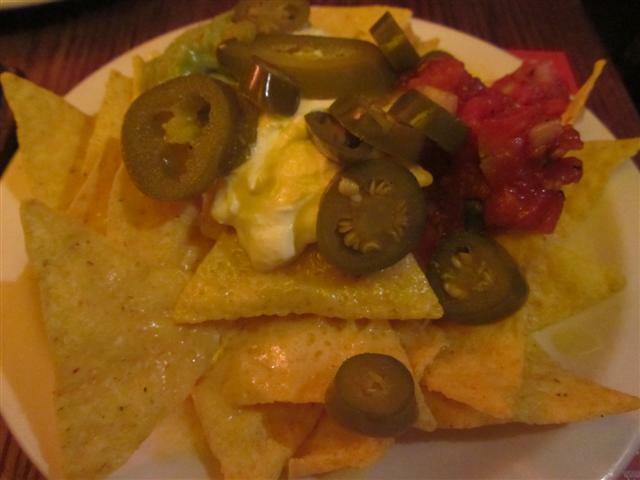 The nachos were in a separate bowl and were generously topped with cheese, guacamole, salsa and jalapeno peppers. The grilled flatbreads with hummous was a good way to start. Then onto the quesadillas filled with chicken and cheese. The highlight for me were the lollipop chicken wings. These were the ideal finger food. The chicken wings had a subtle coconut flavour coming through. The breaded chicken strips were also very tender and tasty. If that wasn’t all filling enough, we still managed to have the grilled portobello mushroom topped with halloumi cheese, patatas bravas and chorizo. There was definitely a lot of food and it was a great selection. As for drinks, I chose the peppermint tea which was served by the cup. The waitress wasn’t sure which tea they had, so she made the effort to go and bring me the selection that they had. It was easy to spend a lot of time at The Cuban and as we were finishing our meal, the music started to get louder. We hadn’t realised that it was fairly late into the night as the hours had passed by real fast. As the elevator doors opened on our departure, we were transformed into a Cuban dance place with a good vibe. This time round, we were done in for the night but I’m sure we’ll return on another occasion to dance the night away!